You must have cookies enabled to use the Rick Steves Travel Store. Click here for more information on how to enable cookies. Also included: a 10¾" x 19½" full-color foldout Planning Map with a detailed close-up of Vienna's old town (with major sights), plus two zoom-outs of Greater Vienna on the back, as well as a handy schematic showing major transit lines. Dimensions: 8" x 4 ½" x 1"
Is This the Right Book for Me? What's the difference between this Vienna, Salzburg & Tirol guidebook and Rick's Pocket Vienna guide? The biggest difference: The full-size Rick Steves Vienna, Salzburg & Tirol is not only a comprehensive guide to Vienna, but also covers Rick's favorite Austrian destinations, as well as nearby Bratislava, southern Bavaria, and the Dolomites. 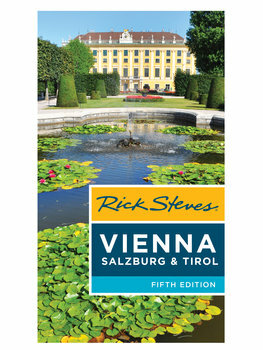 Rick Steves Pocket Vienna works best for people taking a short trip, or perhaps a return trip, to Vienna — and not venturing beyond it. Like our other Pocket guides, Pocket Vienna is smaller than the complete guidebook (and in full color) but still offers our best sightseeing advice and a handful of self-guided city walks and museum tours. Latest updates: When we learn of critical changes to the information in our guidebooks on Austria, we post them. (Of course, it's still smart to reconfirm critical transportation and sightseeing details locally.) Armed with a Rick Steves guidebook and these late-breaking updates, you're set for a great trip! Submit feedback: Once you've used this book in Europe, we'd love to hear your feedback — good or bad — about our advice on sights, hotels, restaurants, and travel tips. We're also interested in any tips or discoveries you made while in Europe. Your comments help us improve our guidebooks for future travelers.